The Rockville Bridge is said to be the longest stone arch railroad bridge in the world. Completed in 1902 by the Pennsylvania Railroad, it has forty-eight 70-foot spans, for a total length of 3,830 feet (1,165 m). The bridge links Harrisburg, Pennsylvania with the west shore of the Susquehanna River. The original bridge on the spot opened on September 1, 1849, when the PRR started operating over it. 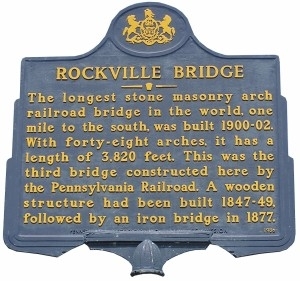 The Northern Central Railway built the Marysville Bridge to the north in 1858, and later moved to the expanded Rockville Bridge. Currently, the Rockville Bridge has 3 active tracks; it had four until one was recently removed. It is used by the Norfolk Southern Railroad and Amtrak.